The show critics are calling “Extremely strong and hugely entertaining” is comin’ to town with holiday swing!! 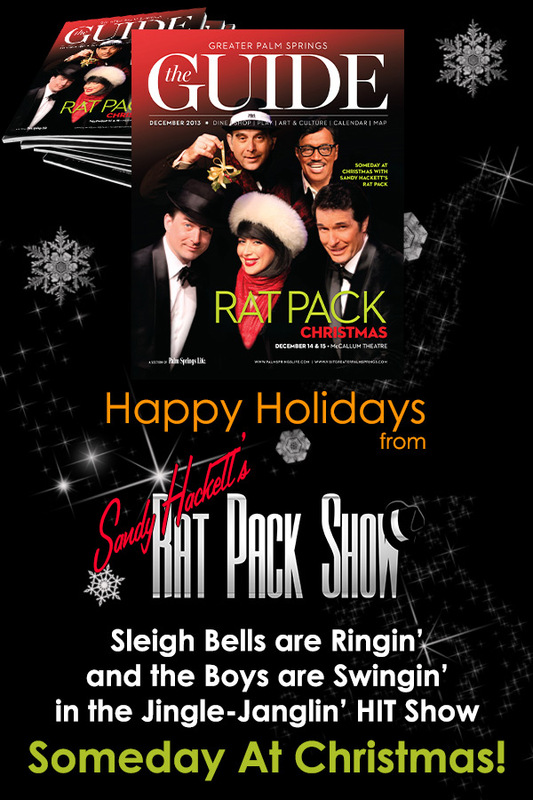 Enjoy those swingin’ Rat Pack tunes along with all your Christmas favorites! This fun, entertaining and touching holiday show, “Someday at Christmas with Sandy Hackett’s Rat Pack” includes classic songs written by legendary songwriter, Ron Miller – and shares the holiday spirit in festive Rat Pack style! Other videos from Sandy's Rat Pack! 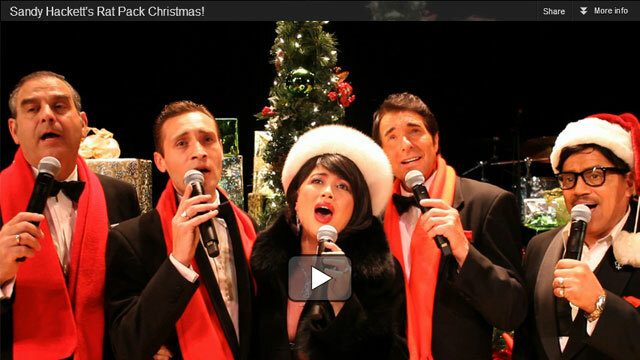 VISIT THE NEW SANDY'S RAT PACK CHRISTMAS SITE! FOR SANDY HACKETT'S RAT PACK SHOW! AND THE REVIEWS KEEP COMING!! "For our Gala Event, we had no idea that your performance would turn out to be the highlight of the area's entertainment year!" As excited as we were to secure the REAL Rat Pack Show for our Gala Event, we had no idea that your performance would turn out to be the highlight of the area's entertainment year! From 5 minutes in, the audience was captivated by the talent, the energy, and the professionalism that you all brought to the stage. I can't say it any better than to state that the Mayor of the city proclaimed the evening as "the best show he has ever seen." We can't thank you enough, not only for the wonderful show but also for displaying the utmost in class as to how you received and engaged the entire Capital Region audience. We are already planning your return to the Palace Theatre as soon as you set your next tour. Sandy Hackett's Rat Pack Show is the one to see." "As Joey Bishop, Sandy Hackett was the glue that held the show together. His hilarious stand-up routine had the crowd in stitches, as did his schtick in between songs." "To end the first act of what is essentially a musical, Louie Velez provided his remarkable interpretation of Sammy Davis Jr. on a swinging version of Harold Arlen's “That Old Black Magic” and especially on Anthony Newley's “What Kind of Fool Am I,” belting out the lyrics just like Sammy used to do." "Lisa Dawn Miller provided the encore to a standing ovation with a moving version of her father's “If I Could,” an inspirational song about parent-child relationships that was a nice touch on Mother's Day." "...the actors have the mannerisms of the icons they portray down pat." "Sandy Hackett's Rat Pack Show is not an impersonation show although the actors have the mannerisms of the icons they portray down pat. It is a show that pays homage to the Rat Pack, the era from which they came, the music they played and the smoke-filled lounges they performed on; all recreated with genuine affection and respect for the artists they are portraying." "The whole premise of the original Rat Pack show was great entertainment created out of great friends playing around on stage. Sure there was some singing but the original show was not about song and dance; it was about how these guys interacted with each other and that's the way this show is too!" "Sammy Davis Jr. finished the first half of the show with an original song written by Ron Miller, one of recent times most renowned songwriters and father of Lisa Dawn Miller, co-star and co-producer of the show. After the interval Frank Sinatra did several numbers including another Ron Miller song in duet with Lisa Dawn Miller, "Wasn't I a Good Time?" whose refrain looks to examine lost love with regret; brilliantly sung by Frank and Frank's One Love." their energy and creativity as well as to the talents of the original members of that Pack." "How could you not really dig this one? Buddy Hackett's son, Sandy, has brought the Rat Pack back to life with his wife, Lisa Dawn Miller, who is the daughter of songwriter Ron Miller. And it is a sterling tribute to their energy and creativity as well as to the talents of the original members of that Pack." "Sandy Hackett has got Joey Bishop’s moves...it's a great evening." "Danny Grewen plays Frank and he's got the pipes and the hat." "Wallek has the looks as well as the pipes and when he lets us sing along with him doing That's Amore, it was as if we were back in Vegas." "Dezmond Meeks plays Sammy Davis, Jr. Terrific presentation, dance, voice and humor." "Lisa Dawn Miller comes on stage as 'Frank's One Love' and beautifully sings Ron Miller's 'Wasn't I a Good Time.' She really belts that one out..."
really felt like the boys were back in town." "The Cobb Energy Performing Arts Centre is a great gem in Atlanta. The sleek and modern structure is an inviting venue. On this night, the theatre had the buzz much like the infamous Sands Hotel in Las Vegas. They came to see them, the legends the original "Rat Pack", Frank, Dean, Sammy and Joey. "Sandy Hackett's Rat Pack Show" began with a video montage highlighting each of the greats, with the finale being the implosion of the Sands. Then, with an exciting light show the Rat Pack emerged. To an adoring audience, the Rat Pack, started the show with "Hello Again." It was surreal to see them on stage. You really felt like the boys were back in town." "Sandy Hackett, the son of legendary Buddy Hackett, performed as the comic of the quartet, Joey Bishop. He had the crowd rolling in the aisles." "The theatre roared when Dean Martin (Tom Wallek) performed 'That's Amore.'" "Dezmond Meeks' rendition of 'Will I Still Be Me' is fantastic." "You could feel the presence of Frank in the room." "An all ages show that is sure to go on for many years to come." "...Lisa Dawn Miller came out to belt 'Wasn't I A Good Time,' also written by her father, in her soaring voice." "There is a timeless quality to the music, the look and, most importantly, the attitude projected by the foursome - and all three are conveyed with a wink, a nod and a lot of vocal prowess in 'Sandy Hackett's Rat Pack Show'"
"An 11-piece band played as the core four - creator Sandy Hackett as Bishop, Tom Wallek as Martin, Dezmond Meeks as Davis Jr. and Danny Grewen as Sinatra - smoothly whirled through two acts of classic songs, some soft-shoe dancing and some truly funny jokes (mostly by the multi-accented Hackett)." "The first act showcases the material of Martin - his womanizing ways given a charming buffoonish-ness by Tom Wallek. Wallek sounded perfectly adept on the Italian favorites 'That's Amore' and 'Volare.'" "It was impossible not to be impressed by Meeks' terrific range as he crooned "That Old Black Magic" and "Will I Still Be Me? ", an original song written by Ron Miller, father of Lisa Dawn Miller." "Danny Grewen, meanwhile, imbued Sinatra with a perfect level of chilliness. A medley of Sinatra songs ("Come Fly with Me," "The Best is Yet to Come," "Fly Me to the Moon" among them) was delivered with ease and style." Lisa Dawn Miller came out to belt "Wasn't I A Good Time," also written by her father, in her soaring voice." "The 'Rat Pack' really is back with this great production." "What you will see is a critically acclaimed, impressive and entertaining theatrical production which includes exciting new arrangements of classic Rat Pack songs everyone knows and loves. As a bonus, audiences will also be treated to original, never-before-heard songs written by the late, legendary songwriter, Ron Miller." "Hackett is dead on as Bishop and his timing is always perfect. He even tailor makes some jokes for Atlanta and brings in modern day references, just like the Rat Pack would've done." "Tom Wallek, who plays Dean Martin not only is funny and can sing, but looks and acts like Dean did in his prime." "Dezmond Meeks (Sammy Davis, jr.) dances and sings his way right into our hearts." "The best was really yet to come we found out, when Frank took the stage and belted out a Sinatra medley." "This show is about their music and interactions. There isn't a tacky set to distract you, just the guys, a band, and some good-nature ribbing between them. It's fun from the opening curtain." ON TWITTER, FACEBOOK AND YOUTUBE!